An Air India technician has died after he was sucked into an aircraft engine at Mumbai airport, the airline says. Air India chairman Ashwani Lohani described the accident as a "mishap", but it is not yet clear what happened. The Times of India, quoting Air India sources, reported that the accident occurred on Wednesday evening when the co-pilot started the engine at the Chhatrapati Shivaji airport. The victim, identified as Ravi Subramanium, was standing nearby. The newspaper said the incident happened when the aircraft was being pushed back by a tow van from the parking bay before take-off. "No one knew what happened. All of a sudden we heard that the technician has been sucked into the engine," the newspaper quoted an airline source as saying. 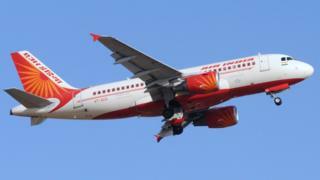 An Air India official told The Hindustan Times they were "absolutely clueless on how this person was near the aircraft". "Only an inquiry can establish whose negligence it was and whether the engine should have been switched on at that time," an airline official said. The Indian Express reported that the victim was "near the nose wheel" with the tow van "when the engine started and he was sucked in". Mr Lohani has expressed his condolences to the family. The state-owned national airline, which is battling huge debts and not reported a profit since 2007, has been often hit by technical glitches, delays and crew turning up late for flights. In April, Air India removed two pilots from duty after they reportedly fought inside the cockpit just before takeoff from Delhi. In 2009, pilots and cabin crew came to blows on an Air India flight from the United Arab Emirates to Delhi, with 106 passengers and seven crew on board.